The ideal Victorian home window replacement in the San Francisco Bay Area is a perfect blend of beauty and functionality, of durability and design. The perfect San Francisco Victorian window allows plenty of light and ventilation but also offers ease of use, security, and even noise reduction for busier areas. Styles tend to be more traditional and include mostly horizontal windows, garden windows, and some bay/bow windows. There are occasionally special shapes, louver windows, and acoustic windows involved as well. When choosing a window replacement for a Victorian home, you can select from an array of architecturally pleasing designs in solid wood, wood clad materials such as aluminum or even San Francisco climate-stable, low-maintenance vinyl or fiberglass with high efficiency double or triple pane glass. There are also reflective coatings that protect the interior of your San Francisco home from damaging UV rays while saving energy and keeping you comfortable. 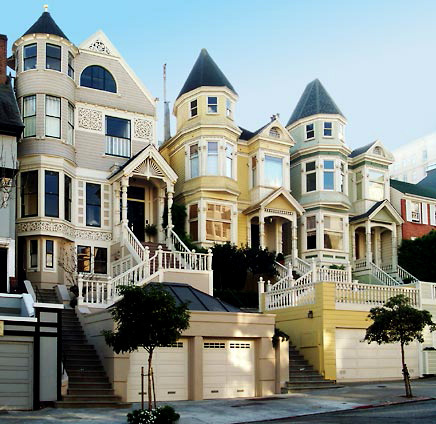 Replacement windows for San Francisco Victorian structures come in many different colors, styles, and features, it helps to employ the expertise of someone familiar with the various features and efficiency characteristics of the latest replacement windows in traditional designs. Whether your primary consideration is the amount of light, efficiency, security, architectural beauty, or simply economy, we can guide you through the confusing array of choices to find the best replacement windows to suit your taste and budget for your Victorian home. Whatever replacement windows you ultimately choose for your San Francisco Victorian home, the most important factor with any new windows is the quality of the installation. This is particularly true on the very usually ornate Victorian homes. San Francisco homes in general, particularly Victorians have very distinctive architecture and features. You cannot just let anyone work on them. They must be experienced with high attention to detail. Installation can matter more than design, efficiency, and price. Even the best replacement window will yield poor service on a Victorian or any other home for that matter if not properly installed. A quality installation may take more time and effort but will pay for itself many times over during it’s lifespan. An artisan installation by our qualified and experienced San Francisco technicians will give you the greatest beauty, comfort, efficiency, and life span for your new replacement window. Let our experienced San Francisco window professionals help you choose ideal window solutions for your Victorian home installation that offer the highest quality, beauty, and value for your home. Call today for a free design consultation.